The championship game of the Gold Bracket in the Michelle Carew Classic lived up to the hype as Norco (California) High, ranked #1 in the Extra Elite Eighty High School Rankings for the entire season, pulled out a huge comeback Saturday night, winning 7-6 over Orange Lutheran after falling behind early in the tournament finale 6-0. It was the second time this season the Cougars had to beat the Orange Lutheran after Norco topped the Lancers 6-2 on February 22 at the So Cal’s Best tourney in Chino Hills. For most of the night, however, it looked like Orange Lutheran would take the title after falling short last year in the same championship game as Cathedral Catholic took the Gold Bracket (winner’s bracket) finale in 2018. Sarah Willis, the dominating senior pitcher/hitter for Norco bound for Washington, gave up a two-run single in the 2nd inning to senior Lancer infielder Sarah Taylor, a Mercer signee, and starting pitcher Miranda Stoddard, a senior headed to Kentucky, drove in another run in the third to put Orange Lutheran up 3-0. Norco head coach Rick Robinson pulled Willis and brought in freshman standout Stevie Hansen but uncharacteristic mistakes by the Cougars—a wild pitch and then a defensive error—put the score at 5-0 after three innings. Kinzie Hansen's bat continued to sizzle on the final day of the Michelle Carew Classic as she had a three-run home in the semi and a big RBI single in the finale. Photo: Steven Doi / Norco Softball. 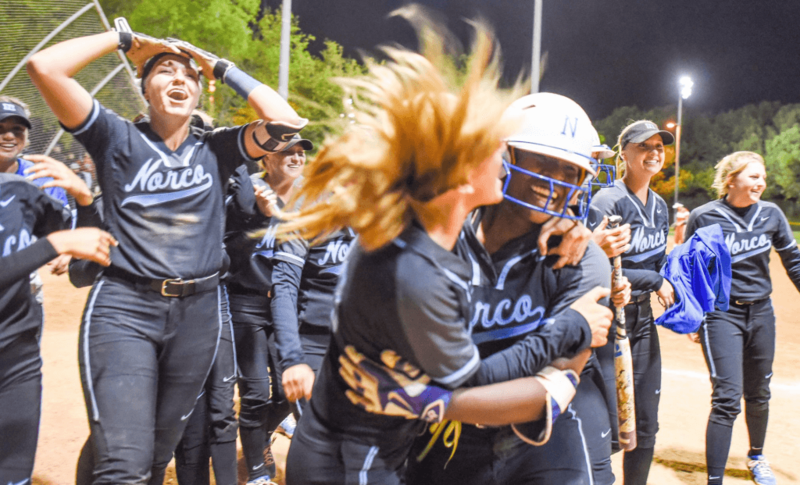 It wasn’t like Norco didn't have early opportunities—the Cougars stranded a pair of runners twice in the first three innings—but trailed 6-0 lead going into the bottom of the 5th inning and it looked like their 22-game undefeated streak in 2019 was in serious jeopardy. However, with Stoddard in command pitching a one-hitter, a throwing error in the 5th inning allowed Norco to put its first two runs on the board and an RBI single by catcher Kinzie Hansen, the All-American senior who has signed with Oklahoma, cut the lead in half before an RBI single by junior outfielder Hannah Doi brought the Cougars within one at 6-5. Suddenly, after plating five runs in the 5th inning, all the momentum had swung to Norco and in the 6th inning Willis showed why she is as dangerous with the bat as she is with her arm as she blasted a two-run homer to the opposite field to give the Cougars their first lead of the game (after scoring seven unanswered runs in the 5th and 6th innings). Stevie Hansen closed the door for the 7-6 win and was the star of the night as she got the win after hold the powerful Lancer offense scoreless over the last 5 2/3rd innings and allowed her team the opportunity to climb back into the game. It was the second time in three years Norco won the Michelle Carew Classic and ensures the juggernaut team will remain #1 in the country. Norco (23-0) will next play on Tuesday against King (Riverside, California) while Orange Lutheran (16-6-1) will take the field the same day against Aliso Niguel (Aliso Viejo, California) High at home. 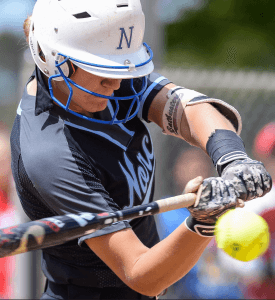 Earlier Saturday in semi-final action, Norco beat Los Alamitos 3-2 on a first inning three-run home run by Hansen that Willis made stand and Orange Lutheran topped Gahr 5-3 to set up the title game matchup. We’ll have more on the Carew Classic in the upcoming days but heading in the wee hours of Sunday, the Norco undefeated season is still intact and the Cougars remain the team to beat in the national high school rankings entering Week 2 of April play.